A University of Newcastle study has shown fibre supplements positively altered the gut microbiota – a community of good and bad bacteria living in the bowel – and in turn reduced airway inflammation in asthmatics. More importantly the research offers hope to the estimated one million Australians struggling to control their asthma with an additional drug-free intervention, says Professor Peter Gibson, president of TSANZ. “This is the first time anyone has looked at the impact of altering the gut microbiome on asthma control in humans. We’re at the tip of a new paradigm for how diet can be used to treat asthma,” said Prof Gibson. 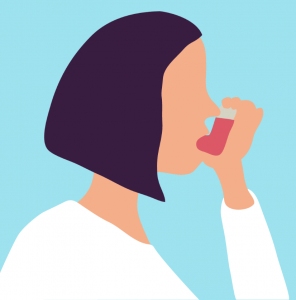 Current asthma treatment is aimed at preventing exacerbations, with the key medications – glucocorticoids – costing more than $300 million per year in Australia. However, despite their availability, there were 37 830 asthma hospitalisations in Australia in 2010–11. Prof Gibson says by including soluble fibre in the diet you can potentially reduce the reliance on these medications. “The treatment of asthma is focused on things that we breathe in, avoiding irritants that we breathe in and giving drugs that we breathe in and so here we take a completely different approach and focus on the persons’ diet and how we can modify their diet to improve their asthma,” Prof Gibson told AAP. As part of the study, 17 patients with poorly controlled asthma despite the use of inhaled steroid medication were given 12 grams of daily inulin – a soluble fibre supplement. All patients had a reduction in airway inflammation and an improvement in their asthma control, so improved lung function and fewer symptoms such as wheezing. Inulin supplementation for 7 days led to changes in the gut microbiome, with an increase in the beneficial bacteria, Bifidobacterium and Anaerostipes. The fibre works by suppressing the overactive immune system that exists in people with asthma. “Soluble fibre doesn’t get digested until it reaches the large intestine and then the bacteria that are present in the large intestine breakdown the fibre to produce metabolites called short-chain fatty acids and they can go back into the bloodstream and they affect immune cells which control inflammation,” she said. 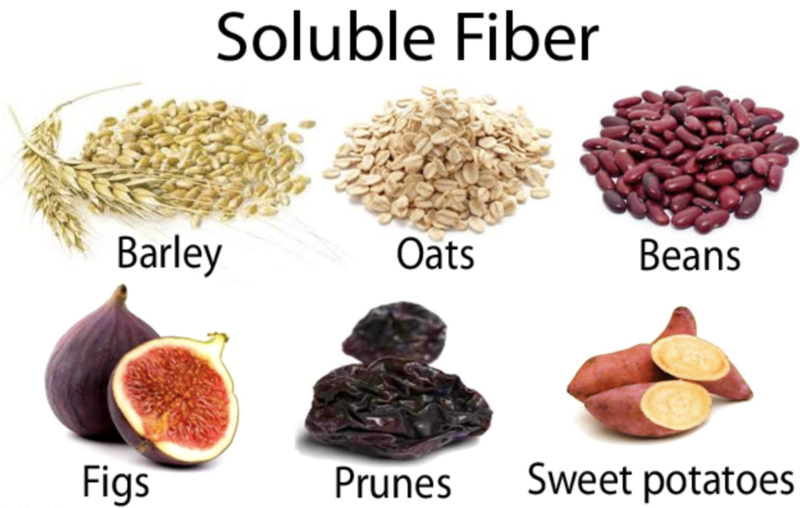 Dietary fibre exists in soluble and insoluble forms. Insoluble fibre passes through the gastrointestinal tract without being digested and provides the bulk for the production of faeces and removal of waste. 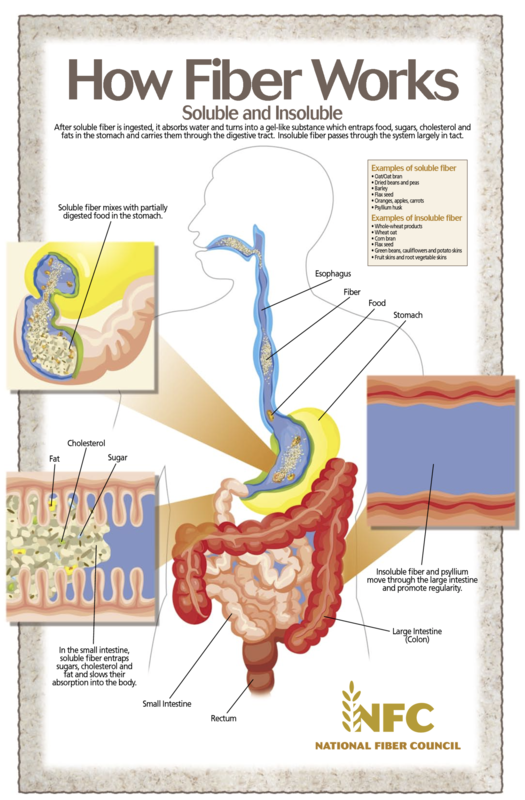 Soluble fibre behaves very differently as, while it passes through the small intestine intact, once it reaches the large intestine, it is partially or completely fermented by commensal bacteria to produce bioactive metabolites, including short chain fatty acids (SCFAs). The key SCFAs are: butyrate, the major energy source for colonocytes; propionate, which is mostly absorbed by the liver; and acetate, the primary SCFA that enters the circulation, which may be most relevant to the lungs. The composition of the gut microbiome determines the rate and extent to which soluble fibres are digested. Certain bacteria, such as Bifidobacterium and Lactobacillus, are among the most potent producers of SCFA. SCFA production is also dependent on the type of soluble fibre consumed. Fructooligosaccharides, which include inulin (a b2–1 fructan), are among the most highly fermentable soluble fibres and are potent sources of SCFA. In addition to providing substrates for fermentation, some soluble fibres, including inulin, act as prebiotics and preferentially stimulate the growth of SCFA-producing bacteria. Thus, the interplay between dietary fibre and the microbiome regulates SCFA production. SCFA have attracted much attention in recent years due to their anti-inflammatory properties and appear to be crucial to the protective effects of dietary fibre. Animal models have provided insight into the mechanisms by which SCFA could benefit asthma. Asthma is driven by an exaggerated immune response to common exposures such as allergens and viruses, leading to inflammation of the airways. SCFAs are able to suppress this exaggerated immune response via two key mechanisms. While soluble fibre in the diet can help manage asthma a diet high in fat can worsen it, warned Prof Wood. Another study, also presented at the TSANZ meeting, has shown the consumption of saturated fats temporarily narrow the airways that carry oxygen to the lungs, leading to coughing, wheezing and shortness of breath. “More and more we are learning about how our Westernised , highly processed diet is negatively impacting our health,” said Prof Wood. Prof Wood and her team are now hoping to secure funding from the National Health and Medical Research Council (NHMRC) so they can conduct a large clinical trial to prove the efficacy of soluble fibre as an asthma treatment. “There is a lot of interest from people with asthma in alternative ways to treat their disease other than just traditional asthma medications so we really do want to push this work forward,” said Prof Wood. While asthma has a strong genetic component, the increase in asthma prevalence in westernised countries in the past 40 years suggests that environmental exposures such as dietary changes are key cofactors. Epidemiological studies support this notion, with western style eating patterns linked to increased asthma exacerbation risk, lung function, wheezing and breathlessness. Westernised diets are typically high in processed foods and low in fruits, vegetables and wholegrains. As a result, many people don’t meet the recommended dietary fibre targets and we have shown that in people with asthma, those with a low fibre intake had worse airway inflammation and lower lung function. This highlights the possibility that supplementing asthmatics with dietary fibre may be beneficial. Further expansion of this work is vital, as patients with asthma are demanding advice on how to better manage their disease using dietary approaches. The use of a non-pharmacological intervention has clear advantages. Soluble fibre targets novel anti-inflammatory pathways, distinct from those targeted by currently available therapies. There is no risk in patients with asthma increasing their intake of soluble fibre, particularly using whole foods such as fruit and vegetables. Medlab W8 Biotic contains Hi-Maize Resistance Starch which is a soluble fibre similar to inulin. Hi-Maize Resistance Starch is also a prebiotic and produces short-chain fatty acids like butyrate that help to support healthy gastrointestinal function. W8Biotic also contains Lactobacillus plantarum (Med 25) and Lactobacillus paracasei (Med 24) to support healthy gut flora. Melrose Omega Fibre is based on Australian Organic Flaxseed Meal, Licorice Root, Slippery Elm Bark Powder and Aloe Vera Juice Powder. Flaxseed meal contains high levels of soluble fibre and the addition of Aloe Vera to Melrose Omega Fibre is for its use in protecting the digestive system by reducing intestinal inflammation. If you would like a personalised soluble fibre recommendation, talk to your Emed Practitioner today. Ground Chicory root (the most common source of inulin due to its extremely high concentration). This cane brewed into a tea and found at most health food stores. Legumes – lentils, black beans, kidney beans. Vegetables – Turnips, sweet potatoes, asparagus, brussels sprouts.